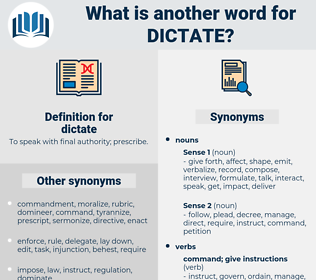 What is another word for dictate? To speak with final authority; prescribe. are in the driver's seat. questions, determine, prescribe, indicate, decide, govern, necessitate, identify, require, anticipate, render. lay, determine, determining, determines, prescribe, decided, deciding, stipulate, Stipulated, stipulates, indicate, write, enact, decide, define, designate, Designating, steer, Establishing, govern, regulate, specify, necessitate, compel, identify, require, inflict, condition, pronounce, guide, formulate, render. Lord Saint George, though he would frequently interfere in matters connected with the property in the manner described, would never dictate and seldom insist. We decided that I should go to her mother to concert with her and dictate to her the precise terms of a refusal which should cut short all Kiusko's hopes. detoxicate, dog-sized, dusty, deject, diazoxide, dacoit, doughty, degust, dashed, disquiet, ducat, detested, decode, dytiscidae, digitate, do good, docket, deck out, deduct, dakoit, decked out, duct, detect, dasyatidae, dickhead, disgust, dickie-seat, deist, death seat, dakoity, dogwood, dead set, deceased, desiccate, dziggetai, dissociate, De Sade, dockside, dedicated, desuetude, dictated, dogtooth, digest, destitute, due west, death's head, dejected, dugout, death squad, dacoity, decade, dissect, detest, digested, dogged, dish out, duckweed, dodge city, dedicate, do-si-do, discoid, dacite, detected, disquieted, dished, dakota, detached, disused, due east, decussate, dissuade, digit, due south, disguised, dioxide, dissected, dig out, dicky-seat, deceit, duck shot, dust, decided, decked, desist, deuced, decide, dighted, die-cast, dazed, dickey-seat, diskette, disquietude, dagda, dicot, decoct, disassociate, decayed, diseased, dead weight, dosed, decidua, disgusted, desiccated. impose, bring down, visit, inflict.